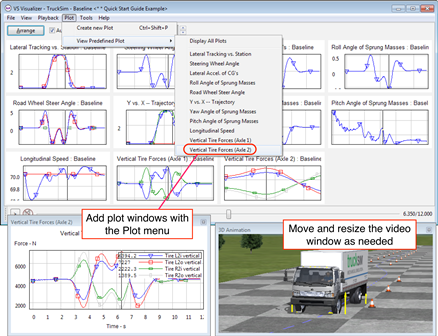 ANN ARBOR, Mich., February 24, 2015 - Mechanical Simulation Corporation is proud to announce the release of TruckSim 9.0 vehicle dynamics software. According to Dr. Michael Sayers, CEO and Chief Technology Officer, "We are in the process of upgrading all of our products, starting with CarSim 9.0 last year, and continuing with TruckSim this month. This is the most comprehensive upgrade since Mechanical Simulation was founded in 1996. TruckSim 9.0 has major enhancements to the math models, the visualization tools, the database, and the overall architecture." In Version 9, TruckSim makes it even easier to simulate tests used by truck manufacturers, suppliers, and researchers to evaluate performance of vehicles that don’t yet exist, or to cover conditions that are difficult or too dangerous to handle with physical testing. Suppliers use TruckSim as a vehicle platform for testing advanced chassis system controllers developed with other software, such as Simulink from The MathWorks. TruckSim 9 has numerous improvements in the math models, such as extending the tire model to handle asymmetric data, or increasing the number of add-on features such as sensors, payloads, etc. The number of roads and target paths was increased dramatically in support of customers developing ADAS and autonomous driving technologies. According to Sayers, "the internal design of the math models has been reworked for version 9. We expect the new architecture to facilitate creation of many more extensions over the next few years." Other parts of the software package were modified extensively, or replaced completely. The plotting tool used since the earliest versions of the software has been replaced with VS Visualizer, the tool used to generate videos for simulated cameras. Plots and videos are now synchronized. Sayers adds, "When you use the plot command to find the maximum value of a variable, all plots synchronize to that time, as do all video screens. Having multiple camera views and multiple plots all synchronized really speeds up the process of understanding complicated 3D behavior of the vehicle." Other significant changes include the redesign of the database to provide compatibility with PLM software management systems and improve transfer of data between engineering groups. A multi-port interface between TruckSim and Simulink that simplifies the integration for engineers working with several Simulink models in the same simulation environment is also provided. For more information on TruckSim 9.0, please visit www.carsim.com. About Mechanical Simulation Corporation: Mechanical Simulation Corporation is a technology leader in the development and distribution of advanced software used to simulate vehicle performance under a wide variety of conditions. The company was established in 1996, and from its Ann Arbor, Mich., headquarters provides car, truck and motorcycle simulation packages, training and ongoing support to more than 110 OEMs and Tier 1 suppliers, over 200 universities and government research groups worldwide, and the vehicle dynamics models used in more than 1400 driving simulators. For more information, visit www.carsim.com.